The incompetent may not recognize their ineptitude. It’s called the Dunning-Kruger Effect. I’ve known individuals who had no idea how unskilled they were. The research of Dr. David Dunning and Dr. Justin Kruger also suggests that highly skilled individuals may underestimate their competence. It’s a gift to believe in someone when they don’t believe in themselves. Olympian Gwen Jorgensen was enlisted to participate in the triathlon while in a cubicle at the accounting firm of Ernst & Young. 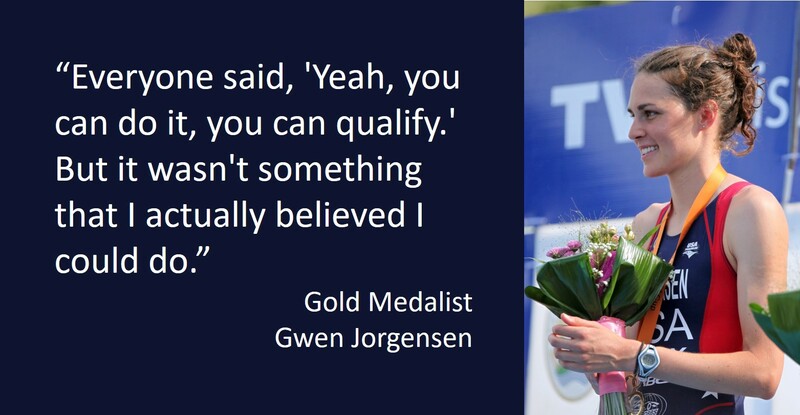 U.S. recruiters believed she could succeed. Jorgensen, at first, didn’t believe. Today, she’s an Olympic Gold Medalist. It began with people believing in her. Successful leaders believe in potential that others don’t see in themselves. #1. Aspire for others in ways that align with their abilities and talent. Find new expressions and applications of abilities. Don’t impose your aspirations on others. Don’t imagine that fixing people ignites their passion. #2. See beyond weaknesses. Some leaders constantly complain about team members. Weaknesses are magnets that capture and narrow a negative leader’s focus. Weakness-centric leaders lose the opportunity to bring out the best in others. #5. Advance untested team members cautiously. You may set them up for failure. Remember that some individuals overestimate their abilities and don’t recognize their incompetencies. Build on success. Go with emerging passions. Stretching people is central to leadership success. How might leaders ignite underutilized potential? Great insights Dan (as always!). We humans are such a contradiction: we are “certain” of so many things for which we only see in part (don’t get me started on the world of politics), while being uncertain of other things for which we should be more confident. Often, we must rely on the perspective and faith of others on our behalf to keep moving forward. When we as leaders (in the family or at work) believe in others, even and especially when they struggle to believe in themselves, it is like life-giving oxygen to the one lacking confidence. Let’s look for opportunities to bring life wherever we are! Nice to see Dunning-Krueger effect get some creditable mention. The flip side of the effect is the over-estimation of competence by the under-skilled, which probably looms larger on the leader’s daily radar. Simply being aware that both sides of the effect are real (but largely ignored) is a great step forward. Thanks, Dan, for putting this on the table. Thanks Jim. It’s surprising that the Dunning-Krueger Effect doesn’t get more play. Leaders face the challenge of convincing someone they aren’t qualified. It’s darn hard work and dangerous too.